Gallia Girl Scout Troop 201 stands outside a store on a cold day selling cookies. GALLIA COUNTY — Area Girl Scouts are once again on the march in one of their most iconic and historic events this Saturday, cookie sales. According to area Girl Scout Troop Ambassador 1764 Leader Cathy Parsons, cookie sales begin Jan. 13 and run to March 25. Cookies are reported to be available for delivery in February. According to Parsons, around 55 girls are in Girl Scouts throughout Gallia County. Parsons said during cookie rallies, scouts will be coached in money management, goal setting, decision making skills, sale safety and walkabouts with girls in the community. Members of individual troops eventually vote on how they would like to spend their money raised through sales. The act of selling cookies is not just about fundraising but also learning skills based in responsibility and independence. According to gsoh.org, the first known cookie sale by the Girl Scouts was in 1917. In 1922, the organization’s cookie recipe and business plan were shared and in 1925 the scouts’ S’mores recipe was first published. In 1935, the Girl Scout cookie first started appearing on cookie boxes and commercial bakers helped to meet growing demands in 1936 with cookie sales going coast to coast in the US in 1937. Girl Scouts are known for their eight cookie recipes, Do-si-dos, Toffee-tatic, Savannah Smiles, S’mores, Tagalongs, Trefoils, Thin Mints and Samoas. For more information, visit Girl Scouts of Ohio’s Heartland website at gsoh.org. 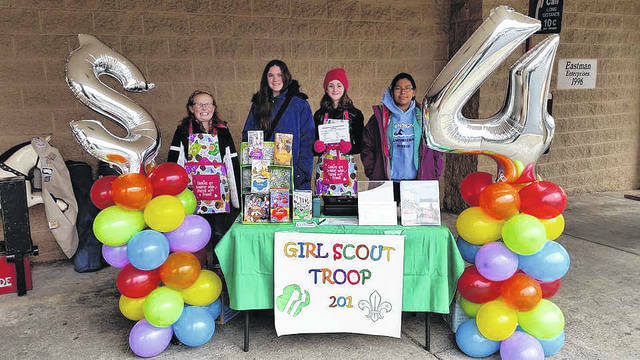 https://www.mydailytribune.com/wp-content/uploads/sites/42/2018/01/web1_25027.jpegGallia Girl Scout Troop 201 stands outside a store on a cold day selling cookies.